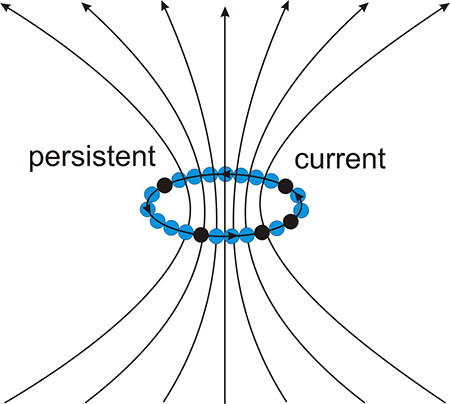 Electrons in pure nanorings or tubes possess eigenstates with circular currents. In the presence of disorder the eigenstates become standing waves suppressing the circular current. A magnetic field parallel to the axis of the tube/ring recreates propagating electron states with circular persistent current. Numerical calculations for disordered rings are performed in the tight-binding approximation for finite disorder and magnetic field. The application of a gauge transformation contributes to an intuitive understanding of the persistent current and its absence for a flux Φ equal to a multiple of half the flux quantum and leads to a formula for the current in the disordered ring with magnetic flux. 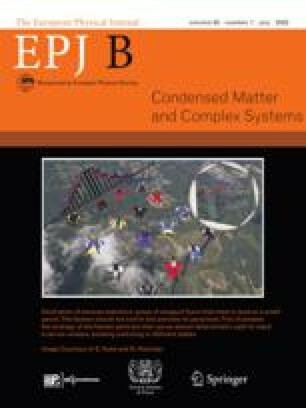 The derivative of the eigenstate energies with respect to the magnetic flux Φ through the ring, dEn∕dΦ, yields an effective circular group velocity and represents an alternative method to calculate the circular current in disordered systems. Current and energy obey the Aharonov–Bohm effect. For large disorder a competition between persistent current and electron localization is observed. Despite the random disorder in the rings the dependence of the energy and the current on the flux is smooth and shows an interesting symmetry. For each state with negative energy there is a state with positive energy that carries exactly the opposite current.